Memoirs are interesting stories from a person’s lifetime. Even “ordinary” memories that reflect living in another time can build up an important picture of our social history, and enable us to understand our ancestors with a deeper appreciation. Many people wish they had captured those special stories of family and friends – but often this realization comes too late, when memories have faded, or the person has died. So start talking to people and collect those stories now, time can run out very suddenly. Mapping a family tree can be an enjoyable activity for those who have lots of time and patience – especially those who enjoy the experience of a detective trail. Tracking down family links and dates has become much easier with improved technology and a huge effort behind the scenes by Genealogical Societies, librarians, etc. Many records are becoming available on CD, the internet, etc. This can be a very time-consuming activity , however – and in the meantime the people with the human stories that “flesh out” the Family Tree and give them life could disappear. Make a start talking to the “memory holders” first. The genealogical information gives an important structure and backbone to the history – but it will still be there to research at any time in the future. 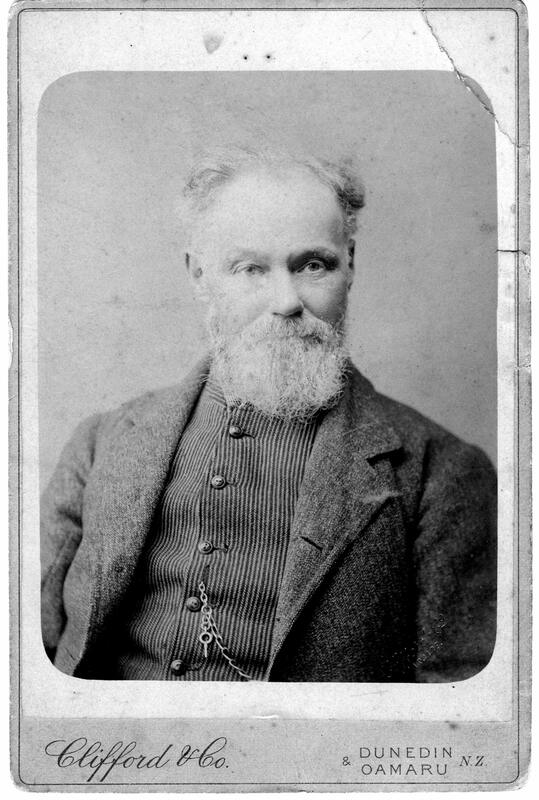 George Miller, Brian’ great great grandfather, who arrived in Dunedin from England in 1858. A glass plate studio photo (very sharp) – probably taken in the 1890s.